The ClickEquations May 2009 Release is now live for all clients. This release adds a number of important core capabilities on top of our existing strengths. There are new bid algorithms and features, powerful new management features including bulk editing, and even richer support for data including support for multiple conversion events, optional revenue allocation models, and compatibility with Google Checkout. 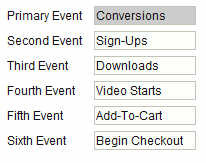 Multiple Conversion Events – You can now track up to six different conversion events in ClickEquations. This allows you to track for example, newsletter sign-ups, downloads, video starts, add-to-cart actions, or any other actions users take on your website in addition to traditional sales conversions. Each conversion event can then be viewed in reports. Use of the new conversion events requires updates to the ClickEquations tags on your website. Negative Keyword Support – You can now view and manage negative keywords directly within ClickEquations Manager. Negative keywords provide an important control to save money, target your ads, and improve your Quality Score. Bulk Editing Capabilities – You can now add and edit keywords or negative keywords in ‘bulk’. Several types of bulk editing are supported – you can simply enter a list of keywords and attributes, paste copied lists, or make edits in Excel and then import them. This feature can be used to easily clone campaigns from one search engine to another. Multiple Item Editing – You can now also make simple changes to multiple items right within the ClickEquations Manager interface. For example, to change the bidding rule for any collection of keywords, you would simply select them within the keyword editing window and change the match type or bidding rule for all of them with a single choice in the keyword editing palette. Google Checkout Support – You can now track sales and revenue transactions made through Google Checkout. These conversions are tracked using your normal shopping cart feature and are included in all ClickEquations reports. Multiple Revenue Allocation Methods – You can now use four different methods of allocating revenue back to your keywords to track and measure your results. While Adwords and most packages use a simple default ‘last-click’ allocation method, many people believe this doesn’t properly value the role all keywords play in generating a conversion. In ClickEquations, you can now choose from last-click, first-click, linear, and weighted allocation methods for use as your primary revenue reporting method. This primary method drives browser-based reports and bidding rules. Via ClickEquations Analyst, however, you can see and compare the impact of all four allocation methods in any report or dashboard. Global Bid Rule Options – You can now more precisely control the application of your bid rules in three important ways. First, you now have the option to define a global maximum bid to ensure that none of your rules exceed a specified bid amount. Second, you can specify the minimum size of a rule-based bid change to avoid frequent small changes. Lastly, you can control the maximum position at which you want to make bid increases – so you don’t overpay for the very top spots if there isn’t sufficient incremental return in your business case. Cost-Per-Acquisition (Lead) Bid Algorithm – You can now choose to create bid rules that target a specific CPA on a keyword or Ad Group basis. These are perfect for lead-generation campaigns with a known CPA or CPL target. You can define these rules to run against any of our six supported conversion events. Bid Rule ‘Intensity’ Control – You can now specify how ‘aggressive’ any of your bid rules are in seeking the defined goal. Higher intensity settings will spend money more liberally to seek the goal faster (raising the bid more dramatically to try and hit a target position, for example) where lower intensity settings will limit spending but perhaps hit your targets more slowly. Simplified Product Margin and Naming – You can now directly update product name and margin information right from within ClickEquations. This makes it easier to use our Net Profit and true ROI based reporting on any campaign or keyword. Simply upload a spreadsheet with your product SKUs and associated names and margin levels, and ClickEquations will calculate the true net profit for every keyword (and ad group or campaign) based on the items sold in each conversion event. This provides much more accurate and actionable information than typical ROAS or Gross Profit reports. There’s a lot of power and capabilities in these features, and we’ll dig deeper into the details and ways they can be used to improve your paid search management in future blog posts.